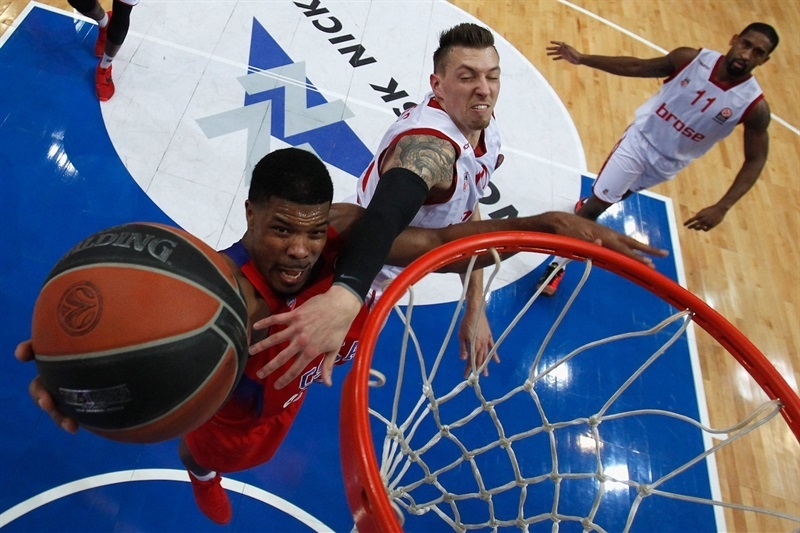 CSKA Moscow got back to its winning ways by routing Brose Baskets Bamberg 91-70 for its third win in as many games between the teams this season. 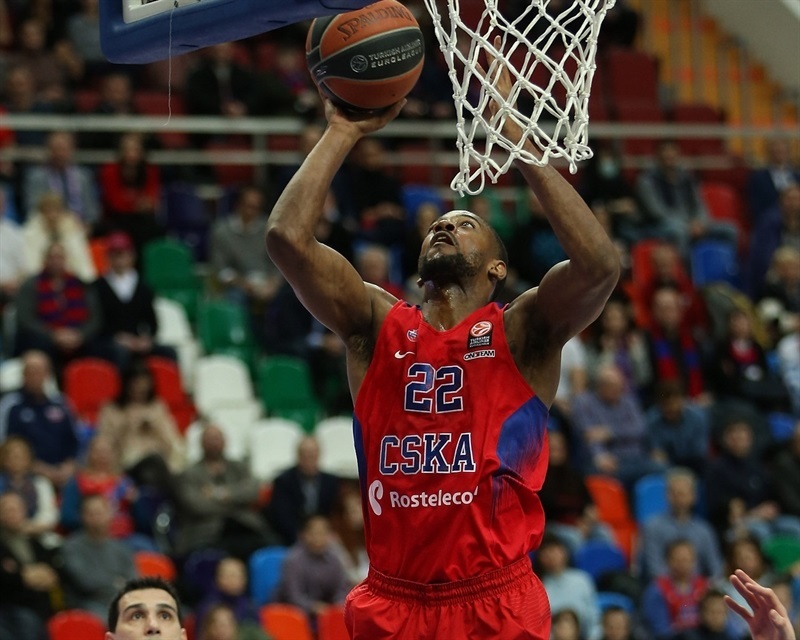 CSKA improved to 3-2 in Group F, while Bamberg dropped to 2-3 with its second defeat in Moscow in six days. 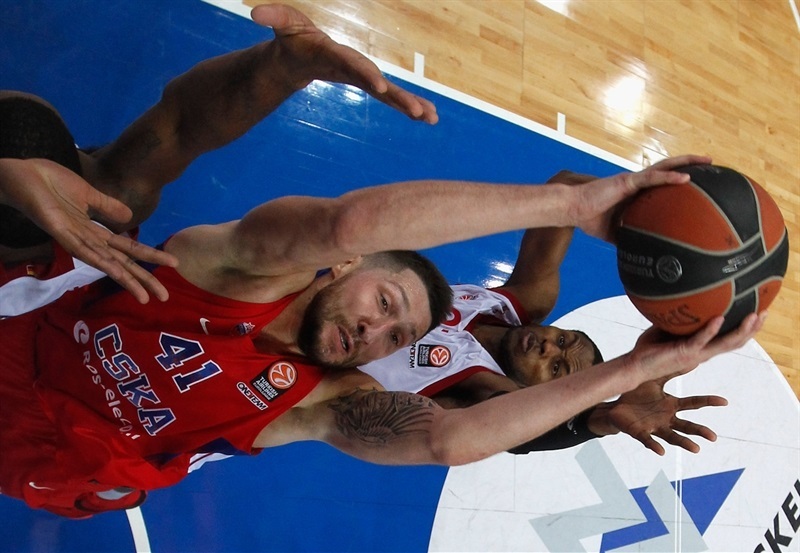 Bamberg scored the first 10 points of the game, but CSKA needed only a few minutes to catch up and then ran away behind the scoring of Nando De Colo and Nikita Kurbanov. The hosts ended the second quarter with a huge 28-5 charge to set a 55-34 halftime lead. 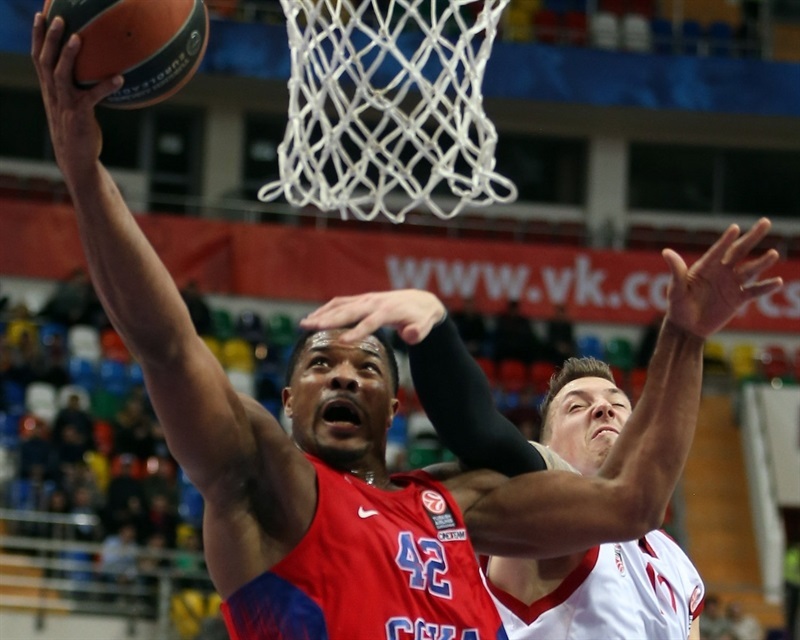 CSKA scored first 7 points of the third quarter to build a 62-34 advantage and cruised the rest of the way. 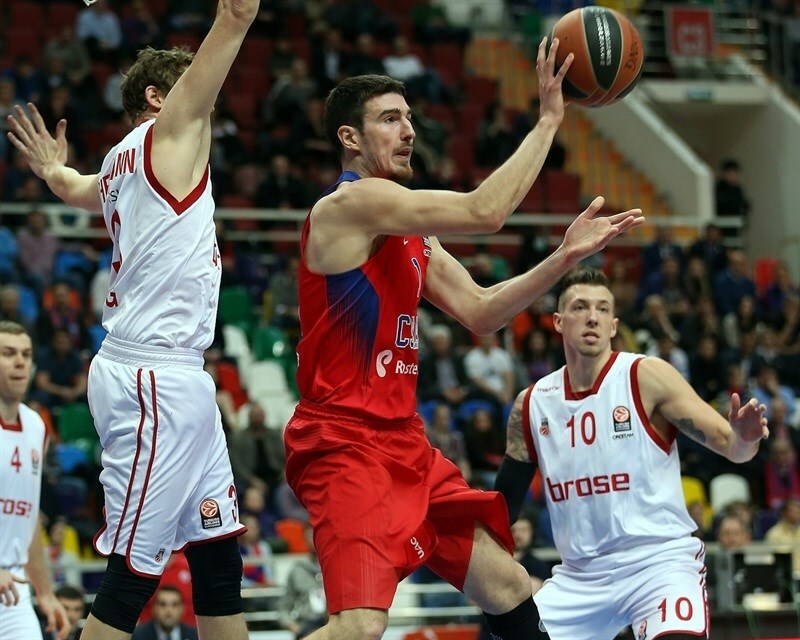 De Colo scored 17 of his 19 points in the first half, and also had 6 rebounds and 3 assists. 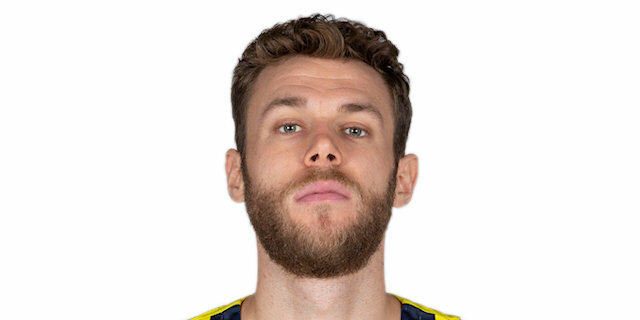 Milos Teodosic added 14 points and 6 assists, while Joel Freeland scored 10 points and Nikita Kurbanov collected 9 points and 10 rebounds in victory. 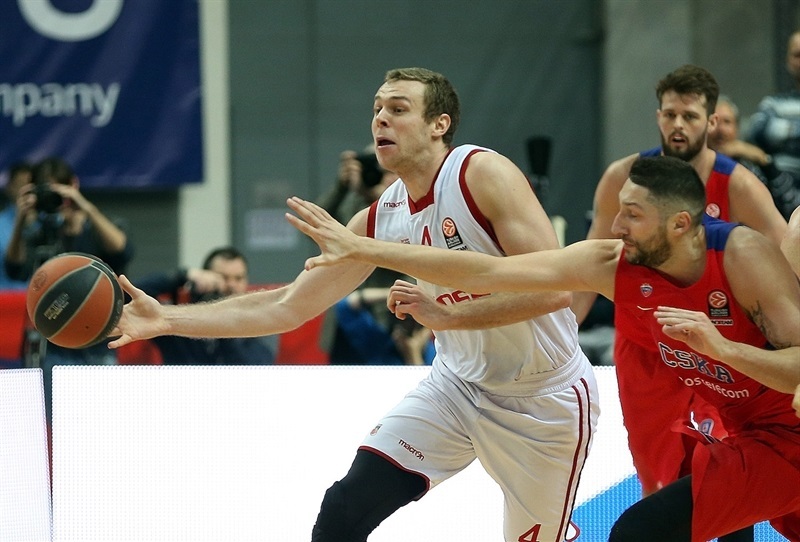 Nikos Zisis paced the visitors with 12 points, Bradley Wanamaker and Elias harris scored 11 apiece, and Nicolo Melli contributed with 10 points in Bamberg’s loss. Zisis hit an open mid-range jumper, and Darius Miller followed with a three-pointer in transition, then added a tough contested layup, making it 0-7. Bradley Wanamaker hit from downtown to open 0-10 margin with two and a half minutes gone in the game. After a timeout, Teodosic nailed a triple to open CSKA's account, but Zizis matched it, getting a shooter’s roll on a three-pointer. De Colo and Miller traded short jump shots, before Teodosic drove for a layup and a 7-15 lead after only 4 minutes. Teodosic and De Colo made free throws to cut an 8-point deficit in half, before Vorontsevich and De Colo hit back-to-back triples to tie it at 17-17. 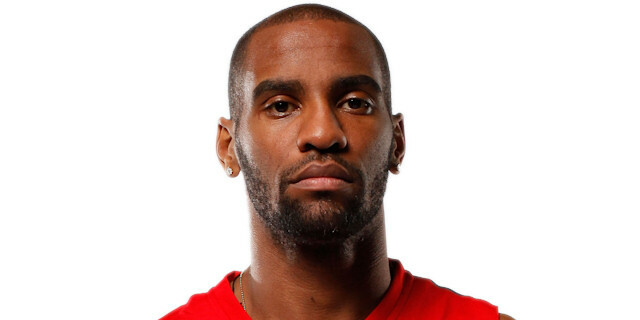 Harris ended Bamberg’s three-minute field goal draught, but Cory Higgins scored 6 points, including a pair of layups, in helping the hosts take a 25-21 lead before Harris ended the quarter with a big put-back dunk just before the buzzer, for a 25-23 advantage after 10 minutes. Patrick Heckmann hit from three-point range to open quarter and added a three-point play to Bamberg’s tally, which put the visitors back in front, 27-29. However, a tip in from Victor Khryapa and a Kurbanov triple restored CSKA’s lead, and sparked a big run. De Colo had a driving layup, Kurbanov scored inside on consecutive possessions, and after a Bamberg timeout, Hines powered inside for a big dunk to make it 40-29 halfway through the quarter. Melli hit a tough baseline jumper, snapping a 13-0 run, but De Colo nailed a step-back triple , then got an assist from Teodosic for an easy layup and a 45-31 advantage. Next, it was De Colo dishing assists, this time a behind-the-back bounce pass to Hines, who turned it into a three-point play. Melli hit a triple for the visitors, but after a timeout, Joel Freeland scored a pair of easy layups. 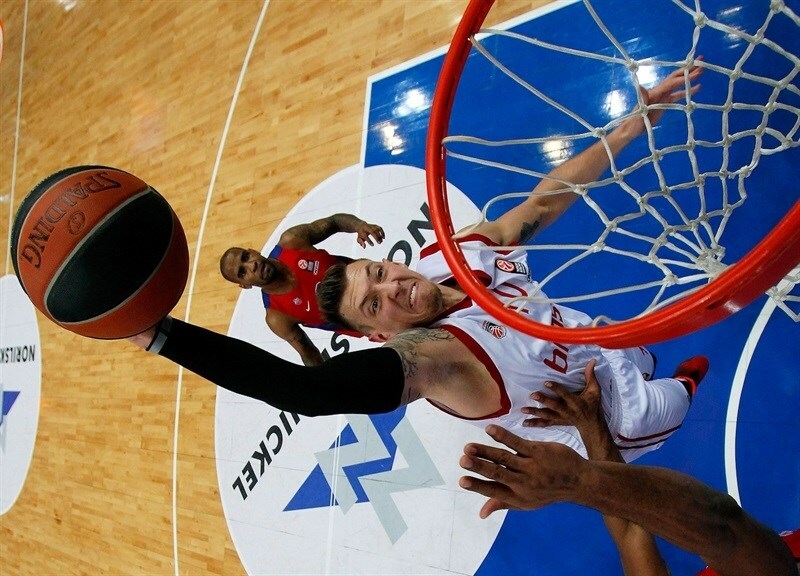 CSKA’s defense did not let up, and De Colo’s jumper capped a 14-3 run to give the hosts a 55-34 halftime lead. CSKA continued with the same intensity after the break, not allowing a single basket for almost four minutes, while Teodosic nailed a jumper, Vorontsevich a triple, and De Colo scored a layup to open a 62-34 lead. Wanamaker finally scored for Bamberg with an easy fastbreak layup, and after Freeland scored inside, Zisis hit a corner three-pointer. Teodosic answered by burying a three-pointer of his own, but Strelnieks matched it by banking in a floater-plus-foul. Higgins made a strong move to the basket for CSKA, but Wanamaker made a steal and finished a fast break with a powerful dunk. Melli hit a triple to cut the deficit to 69-48. Hines worked the baseline for a tough off-balance shot, and added a short jumper, too, helping make it 73-50 after three quarters. 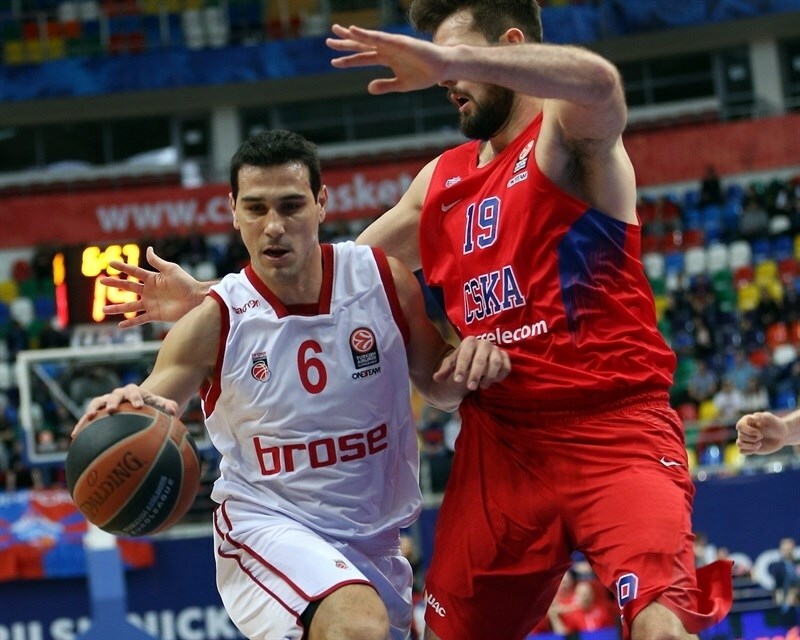 Zisis hit a long jumper to open the quarter, and Khryapa hit a jump shot for CSKA. Aaron Jackson nailed a triple to give the hosts a 25-point lead. Zisis banked in a runner, and Theis had a monster dunk over Hines to cut it to 80-57. Freeland scored a fadeaway jumper, and Dmitry Kulagin nailed a long jumper to give CSKA an 85-57 lead, which matched its largest of the night. Wanamaker drove for a layup on the other end, and Harris hit a tough shot. Staiger’s triple made it 86-66 before Freeland snapped a 1-9 run. Wanamaker hit a long jumper, and Harris made put-back to get Bamberg below 20 points in the final minute, but Demetris Nichols beat the buzzer with a corner triple to round out the scoring. "Congratulations to our players for the victory. We started sloppy, though we worked to start well, we expected Brose Basket to play strong from the beginning. After that we turned our heads, hands, chests to the ball; we played better defense, we were dominant in most game situations and deserved to win. It was another victory in our tough group. I would like to thank the fans, those 8,000 created a great atmosphere and I expect them to come in even bigger numbers. 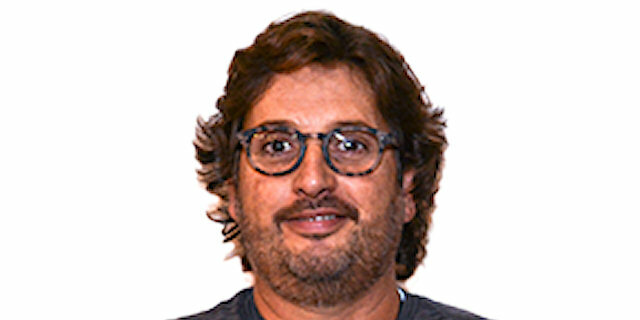 They lift the team, that’s a fact." "Congratulations to CSKA for a well-deserved victory. They were simply better in everything and numbers say that the difference was created in the second quarter. We were never able to come back after that. 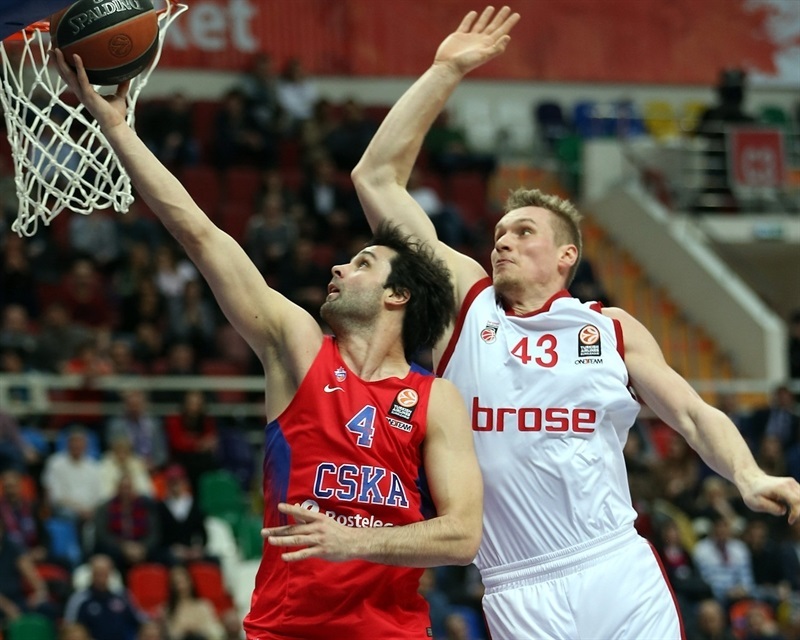 After the loss in Vitoria, CSKA came back playing very tough and physical. And it was a no show for my team. Definitely it is my responsibility. 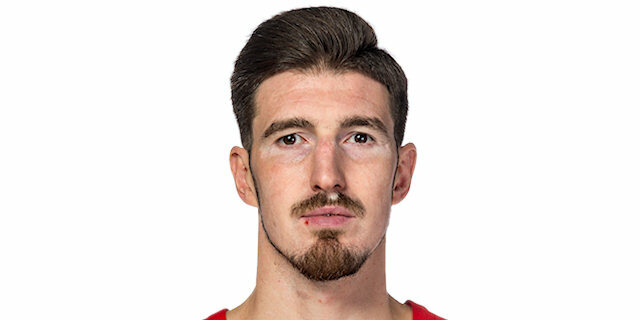 It is understandable that we cannot match CSKA’s talent, because they are probably the most-talented team in Europe, but CSKA also played harder, more physical, and we could do better than this." "It’s never easy to come back after injury. I worked on my ankle to get better. Today we had a great game. Except for the first five minutes of the game, we came back in defense, with more aggressiveness and did what we wanted. And we just kept playing together, and that is good. We have to keep it up like this." "We started not really good, losing by 10 points, then called a timeout to make some adjustments. We played as a team, reacted more appropriate. I think we did a great job and maintained it till the end of the game. Our defense in the first half let us win today, we found the right ways by switching players." "They played better than us, we couldn’t match their physical advantage and mental toughness during the game. CSKA controlled the game, so we could not take any chance to come back. They were better than us, now we need to go back home and work. "